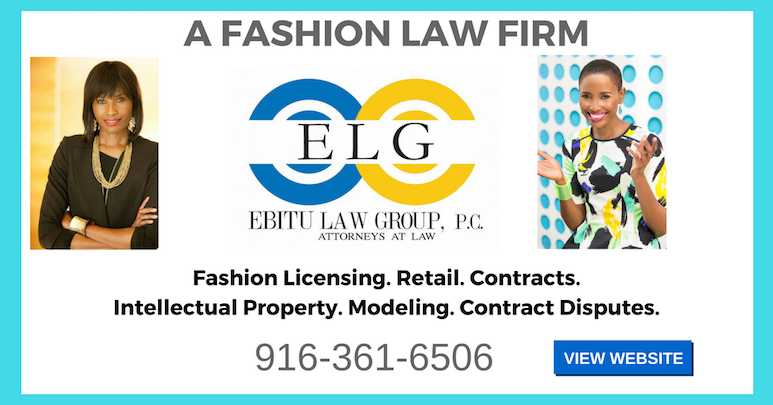 I will join my fashion law colleague Staci Riordan at the 2011 Retail Camp Los Angeles to speak about the legal side of blogging. 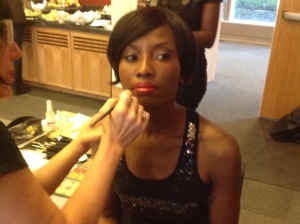 The event is produced by FashionablyMarketing.Me, WWDMagic, Mashable and Woodbury University. 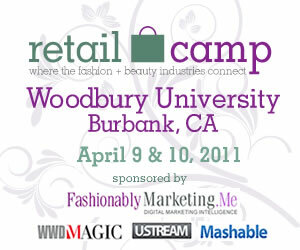 “RetailCamp, an interactive two-day conference, hits Los Angeles April 9th &10th, 2011. RetailCamp brings together apparel and retail industry professionals, bloggers and designers and teaches them how to use technology as a marketing, business and brand development tool.” Please check out the details of the event below. I hope to see some of you there. Click here to purchase tickets. Guillermo Zalamea is Partner at HL Group, a public relations and marketing agency, and runs the firm’s Los Angeles office. Mr. Zalamea served as fashion editor for Esquire Magazine for eight years where he conceptualized and produced the magazine’s monthly men’s fashion coverage. Subsequently, he was Director of Public Relations for Giorgio Armani Spa and Senior Director of Public Relations and marketing for Polo Ralph Lauren. He also directed the marketing and public relations team that launched designer John Varvatos domestically, in Asia, and in Europe. How social marketing, digital media, content and collection curation has impacted the way luxury brands and retailers. How heritage brands and companies use digital media to drive sales and connect with customers. Brains behind the brawn, CEO and co-founder James has established CREATETHE GROUP as the global digital leader in the Fashion & Luxury segment, delivering next generation solutions that are transforming the industry. An Englishman in New York and a Wall Street refugee, James started out as a management consultant for Accenture in London, specializing in strategy, technology and business process re-engineering. He moved to investment banking with Goldman Sachs and later Merrill Lynch, where as the youngest technology director he was a key force in automated and algorithmic trading. CreateTheGroup’s clients include Oscar De La Renta, Donna Karan, Nieman Marcus, Bvlgari, Tom Ford and Dunhill. 1:30 – 2:30 PM: Marketing Trends Of 2011: What Are The Hottest Trends In Marketing? Industry experts discuss digital and mobile marketing strategies designed to create long-lasting relationships with your customers. 2:45 – 3:45 PM Advanced SEO: When Did Social Marry Search? How are you combining your social media and search marketing efforts in order to achieve creative product distribution strategies, increase your page rank, drive search engine traffic and online sales through guest blogging, fashion community collaboration and new online marketing partnerships. Stylesight, the most trusted digital platform for fashion, beauty and interiors trend forecasting discusses how technology has forever changed the process of forecasting. Since joining Stylesight, she has proven to be an authoritative voice of the industry with her finger on the pulse of what’s happening in fashion, lifestyle and design. Her sharp insight delves into every element of a trend, from the runway to the street, in anticipation of the next big idea. As a Trend Director, Lyndsey interprets forecasted trends to Stylesight’s global subscribers through innovative communication tools. Before joining Stylesight, Lyndsey worked for the trim forecasting company, Next Trim, as well as the online information provider, Cool Hunt, collaborating with a number of notable Asian fashion publications including Madame Figaro, Glamour Vogue, Marie Claire and Cosmopolitan. Lyndsey has also contributed Fashion Week runway, backstage and party photos for Fashion File, and written a series of designer collection reviews for Fashion Windows. Lyndsey has a Masters in Fashion Design from Instituto Marangoni in Milan, Italy. 10:00 – 11:00 AM: Business of Blogging 2011 – What You Need To Know about SEO, Driving More Traffic, Getting Brand Sponsors and how to Manage PR Agencies. 11:15 – 12:15 AM: Legal Side of Blogging – FTC Regulations, Legal Disclosures, Reporting Income…West Coast Legal Experts Tell You the 10 Things Every Blogger Needs to Know. 1:30 – 2:15 PM: Blogging & Your Finances – 10 things bloggers need to know about managing their money. 2:30 – 3:30 PM: Finding Your Niche & Your Voice – How and Why You Should March To The Beat Of Your Own Drummer.